More new decals from Roy Sutherland’s BarracudaCals decal company. This sheet is a ‘downscaling’ to 1/48 scale of his earlier 1/32 scale sheet (BC32006) that covers the same aircraft but with an additional one added. ‘SKEETER’ Curtiss P-40E Warhawk of the 9th Fighter Squadron, 49th Fighter Group United States Army Air Force (USAAF). Flown by Second Lieutenant John D. Landers from Darwin, in the far north of Australia in the February of 1942. 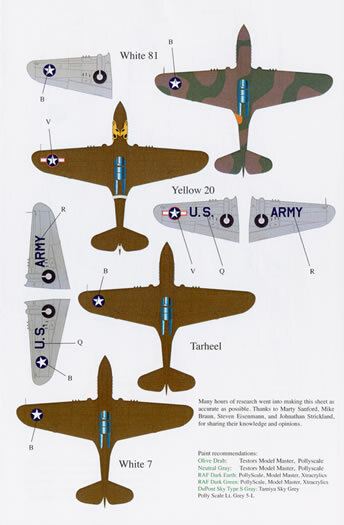 The placement guide advises that opinion is divided as to the finish of this machine with some saying that it was is in the Curtiss factory scheme (for the British export contract) of dark green, dark earth over a light blue- grey and others saying that it was in the then standard camouflage scheme for USAAF aircraft of olive drab over neutral grey. It wears striking diving eagle artwork on a orange yellow background on its left fuselage as well as what looks to be a gun toting mosquito with the words ‘SKEETER’ on both sides of the machines ample intake. The machine’s vertical stabiliser wears the plane in squadron numeral 81 and the lip of the intake is in orange/yellow. Curtiss P-40E Warhawk of the 343rd Fighter Group, who were based in the Aleutian chain of islands, Alaska, in the spring of 1943. It is in olive drab over neutral grey camouflage and features a “tigers head” marking on the nose (hence the Group’s name of “Aleutian Tigers”), a yellow spinner, white fuselage band (command stripe? ), a white vertical stripe on its rudder and yellow 20 plane in squadron number as well large yellow numerals 0610 (a portion of the serial number?) It wears the large U.S. ARMY on the lower surfaces of the wings as well as the short-lived red bordered stars and bars national insignia. The aircraft also bore a name under windscreen although it was uncertain exactly what it was. Roy has provides three ‘best guesses’ of TIGER, SLICK and BECKY – your choice! 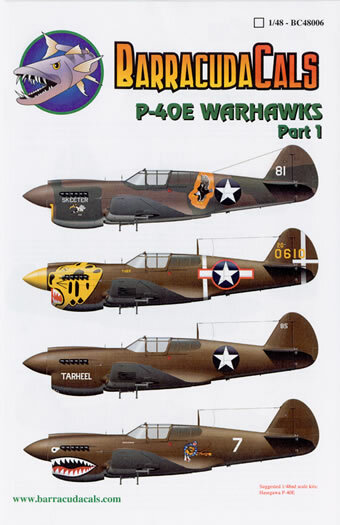 ‘Tarheel’, Lieutenant George Preddy’s Curtiss P-40E Warhawk. 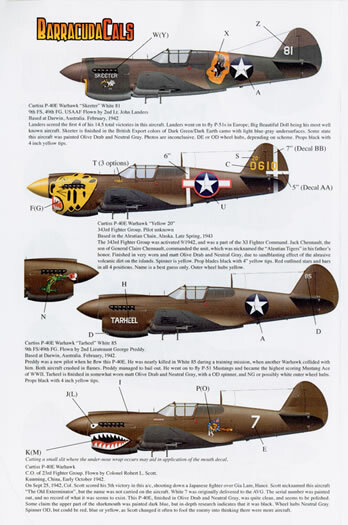 The then Second Lieutenant George Preddy flew this machine in the skies of Darwin, in the February of 1942 when it was assigned to 859th Fighter Squadron, 49th Fighter group. 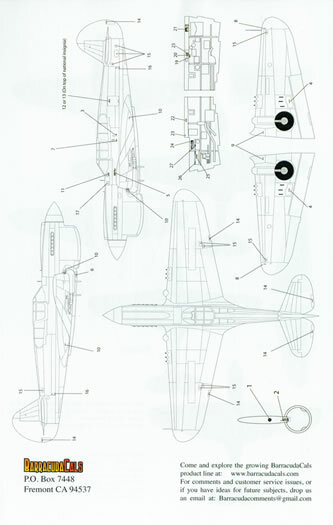 The machine is in the olive drab over neutral grey camouflage scheme and features the name “Tarheel” in white on the port side of the engine cowling, a fire breathing green dragon on the right hand side of the cowling, numerals ‘85’ plane in squadron number on the front of the cowling and on both sides of the vertical stabiliser as well as large U.S. ARMY on the lower surfaces of the wings. Interestingly, the very mangled remains of this aircraft and the one it collided with during a training exercise on 12 July 1942 can be still be seen today lying on a ridge to the north west of the Manton Reservoir. Colonel Robert L. Scott’s Curtiss P-40E Warhawk “The Old Exterminator” when he was the Commanding Officer of 23rd Fighter Group in Kunming, China, in early October 1942. This option is in the same camouflage scheme as the previous ones and features a fearsome shark mouth and eyes markings on its nose, “Flying Tiger” insignia on ether sides of the fuselage, Japanese flag “kill markings” on the left hand side beneath the cockpit, white 7 plane in squadron numbers on the either side of the fuselage and large U.S. ARMY on the lower surfaces of the wings. The decals themselves have been printed by Cartograf. The white and yellow portions of the markings appear to be dense enough to survive application over a dark background and there is a minimum of carrier film surrounding each subject. The detail of the printing is first rate with everything on Scott’s intricate Flying Tiger insignia and Preddy’s dragon markings in perfect register. 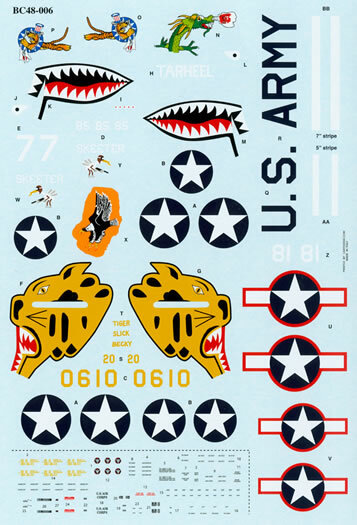 You get a single set of national insignia and two very comprehensive sets of stencil data – the stencil data even extends to the placards that were applied to the cockpit interior. The placement guide is A-4 in size and folded in half to give you four sheets that carry full colour left hand side profiles of each option on one sheet, full colour upper surface views of each option on the next sheet and left and right hand side, and upper and lower surface line drawings to show placement of stencil data on the fourth page. The placement guide carries detailed notes for each option as well as paint matches to the Model Master, xtracrylics, Tamiya, and Polly Scale ranges of model paints. The recommended kit is the Hasegawa P-40E. The placement guide and the decal sheet come packed in clear plastic zip-loc bag. This is another excellent product from Barracudacals. It provides you with first rate markings backed up with excellent support material that is a result of the comprehensive research that Roy Sutherland is renown for.